This stylish 3 bedroom, 3 bathroom detached villa, located in Argaka is part of a small exclusive development, and is being sold FULLY FURNISHED, has TITLE DEEDS, and is only 80 METRES FROM THE BEACH and the crystal clear waters of the Mediterranean. The village of Argaka lies 10 minutes’ drive to the east of the traditional town of Polis with its major facilities of banks, restaurants and tavernas. Another 5 minute drive will take you to the Marina at Latchi, well known for its fish restaurants and wide choice of water activities. The nearest taverna to this villa is only a 5 minute walk away. In Argaka there are plans to build two new golf courses, both to PGA standard. Entrance to the property is along a private road, and from that road this property is the first on the right, with a private drive large enough to easily accommodate 2 cars. From the drive it is a short walk to the porch with stone pillars on either side. The immediate impression upon entering the house is the strategic positioning of the windows and patio doors, which allow as much natural sunlight into the property as possible. Once through the front door there is a large window to the left and then the large open plan lounge/diner is immediately in front. The lounge contains an attractive leather finished 3 piece suite, 2 stylish coffee tables and sliding windows overlooking the sea and the pool/patio area - again showing the intelligent use of natural light. The diner has an attractive wood finished dining table easily able to accommodate 6 people, as well as patio doors and a window at the end of the room. The first of the three bedrooms is on the ground floor. This double room is fully air conditioned, has plenty of wardrobe space and boasts patio doors to the terrace and pool area. The family shower room is next to this bedroom, and this could easily be converted to an en-suite room merely by locking the connecting door from the lounge. This room has a walk-in shower as well as an attractively finished vanity unit and W.C and sink. At the top of the stairs is the Master bedroom. This room has a feature which is most unusual in as much as there are patio doors to a balcony giving fantastic sea views, and from the balcony, there are steps that lead directly to the pool/patio area, so there is no need to go into the main body of the house. The bedroom itself is a double room with exceptionally high ceilings to improve the air flow, and is fully air conditioned and has generous wardrobe space. The en-suite bathroom includes a bath with overhead shower, a wood finished vanity unit and drawers together with the usual W.C and sink. Light coloured floor tiles add to the light and bright ambience. Just across the landing is the second first floor bedroom, again en-suite. 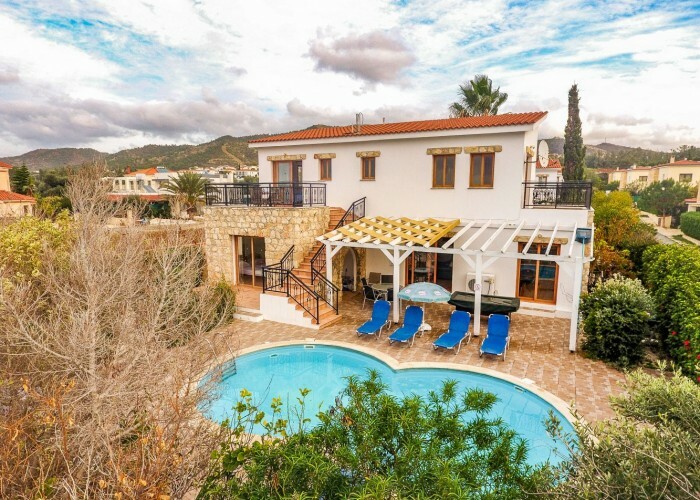 This has patio doors onto a balcony which is south-west facing so there are views of the sea, the Akamas Peninsular and the foothills of the Troodos mountains. The en-suite bathroom has a bath and overhead shower. The easy maintenance garden surrounding the house has a large variety of shrubs and plants as well as a Pomegranate tree. The swimming pool is kidney shaped and is located in such a position as to attract the sun for most of the day, and is overlooked by the large patio. The patio has a pergola which when covered by greenery would provide excellent protection from the scorching Cyprus sun, as well as a barbeque for al-fresco dining. To the right of the patio is a small storage area ideal for storing pool and beach equipment. Don't forget that the beach is 2 minutes’ walk away. Between the property and the beach is a ‘green area’, which has trees and bushes, but cannot be built on.